Have a seat. Get comfortable. This is your opportunity to join Robert Prechter at three of the world’s most venerable institutions as he carefully contrasts traditional social and financial theory with his groundbreaking socionomic research. Have you ever questioned the conventional theory that social mood is buffeted by economic, political and cultural events? The financial markets are random, rational and efficient. Factors like earnings, GDP, war and peace drive the stock market and the economy. When these factors are positive, stock prices rise; when they’re negative, stock prices fall. Market crashes happen when “Black Swan” events like corporate scandals and terrorist attacks scare investors into selling shares. Trends in society like fashion, music and entertainment are mostly random, impossible to predict and entirely unrelated to trends in finance and economics. Now, what if you learned that all of these universal “truths” are false? How would these revelations change the way you live? How would they improve the way you invest? Now’s your chance to put yourself among the small minority of people – including scholars from three of the most venerable institutions in the U.K. – who have adopted a radical new way of thinking about finance, economics and society. If you’re dissatisfied with traditional theories of causality, socionomic theory provides an alternative, highly plausible approach to investing and understanding the world in general. Laid out in high-quality DVD format, A New View of Financial and Social Causality: Robert Prechter at Oxford, Cambridge and Trinity, will change the way you think – forever. The standard presumption is that the character of events regulates social mood; the socionomic hypothesis is that social mood regulates the character of events. Socionomic theory comes to life in two entertaining hours. Not only does Prechter demonstrate the failure of traditional economics to link dramatic events to stock market changes; he also shows you the predictive value of socionomics – with a compelling track record of published opinions based on the Wave Principle at major stock market turning points. Watch Prechter bring his socionomic theory to life in front of a live audience. Please follow the links below to order your copy now for just $24.95. When you order your copy, you get instant access to the streaming version free. Order Now and Get Two Free Bonus Resources: The main portion of this DVD was recorded at Oxford. As a bonus, you also get an informative Q&A session from Trinity College and a special, post-presentation audio interview conducted at Cambridge – at no additional cost to you. Please mention code SOCIONET . Join Robert Prechter in intimate settings at three of the world's most venerable institutions as he carefully contrasts traditional social and financial theory with his groundbreaking socionomic hypothesis. 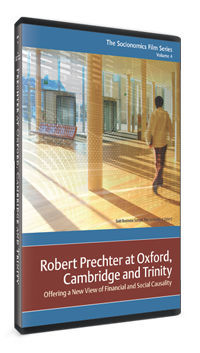 Get your copy of Robert Prechter at Oxford, Cambridge and Trinity today!